Easter is coming soon, and the one thing that all the young children are looking forward to is the Easter Bunny hip-hopping along to their house. All the stores are loaded up with little bunnies and eggs filled with candy. The children walk by the Easter section and long for the basket that they are getting on Easter morning. Dreamworks actually made a movie about the infamous Easter Bunny and his duties to the world. The Easter Bunny has been around for centuries, but what does any of this have to do with Easter? The answer to this, is nothing. The Easter Bunny was actually a tradition that had nothing to do with the Christian Easter. On Discovery News they state that in the 13th century, in pre-christian Germany, they celebrated many gods. One of the gods that they celebrated Eostra and she was the goddess of spring and fertility. Her symbol was the rabbit because of its high reproduction. Spring was the time for everything to grow and prosper. It is also the time for love and rebirth of everything in the world. The Easter Eggs came from the idea of Jesus’s birth and resurrection. It was a simple way for young children to get gifts on Easter, but also celebrating Jesus. The Easter Bunny and the Christian holiday came together when the Christianity came to Germany. They coincided the two celebrations into one, so that everyone could celebrate both. The first actual story was written in the 1600’s, according to iloveindia.com, and the story was about a rabbit on Easter laying eggs for all the children. After the story was published, the Easter Bunny became famous. Children all crowd malls to see the Easter bunny and get one picture taken with this Easter icon. Children obsessed with the Easter Bunny and buy everything they can to remember their love for this special rabbit. In many homes children await Easter morning to find Easter baskets that the bunny hid inside their home. This tradition gives something for children to look forward to on Easter other than getting up at 6:30 in the morning for sunrise service. 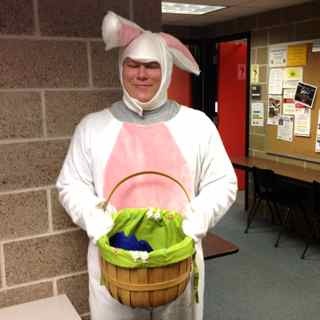 Northeast Community College in Norfolk has their own tradition regarding the Easter bunny. Recently the SGA walked around campus with a young man dressed in a full bunny suit with easter eggs filled with hints about a hunt that is coming up on campus. Many students were surprised by this bunny with a gift. This rabbit brought back old memories of a time that was simple, and fun. Whatever is celebrated on Easter, the Easter Bunny is here to stay because he/she has stolen all the children’s hearts. The children on the other hand, have taken all of his/her candy.